Norrie Waite & Slater have a specialist Personal Injury department and have been dealing with personal injury claims nationwide over many decades. We have a successful track record in pursuing and obtaining compensation for accident victims who have been injured through no fault of their own. In addition to obtaining compensation and recovering any losses and expenses incurred as a result of your accident, if you have ongoing symptoms we can also assist you in obtaining the necessary treatment to speed up your recovery and any specialist equipment or care costs you may need now or in the future. If you have been injured as a result of an accident and need specialist legal advice on the options available to you, our personal injury lawyers will be happy to speak with you, free of charge, either over the telephone, at one of our offices, at home, in hospital or at another place more convenient to you. 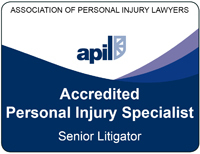 Our specialist Personal Injury Lawyer is a member of the Association of Personal Injury Lawyers (APIL).